It’s fair to say that we all have an idea of what a great hotel in Rajasthan looks like. Visions of havelis and grand entrances, jharokas and chhatris and all the attendant details float through my mind as I make my way towards the RAAS Jodhpur for a couple days of much needed calm. The RAAS hotels (Jodhpur, Devigarh and Kangra which is opening soon) are the first by brothers Nikhilendra and Dhananjaya Singh. And they are magnificent. 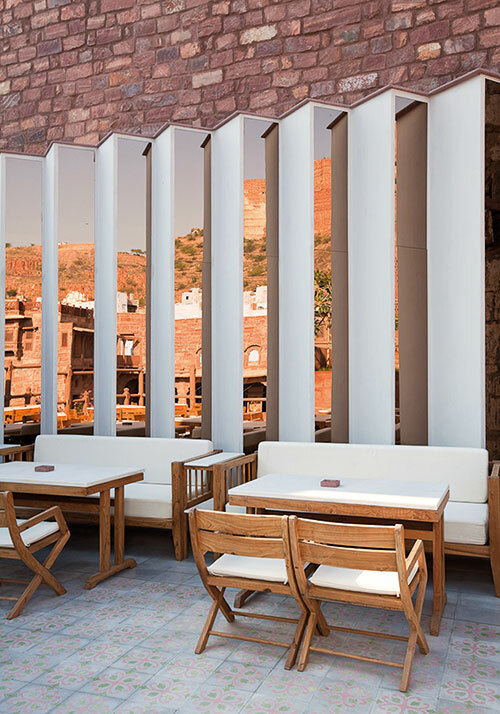 Driving through the outskirts of Jodhpur into the bustling old-walled city through its ancient gate, it’s impossible to imagine that it holds this modern, chic and utterly beautiful hotel, built on the site of and around an 18th-century haveli. As first impressions go, entering through the soaring 35-foot stone walls is one that is hard to top. Nestled at the base of the spectacular Mehrangarh Fort, RAAS is the perfect combination of Rajasthani heritage and contemporary finesse. There is no better view in all of Jodhpur than from the 39 rooms, suites, pool, gardens and terraces of this intimate hideaway. Checking into my fort-facing room I am impressed not by the usual beautiful bed or bathroom but by the numerous architectural details. 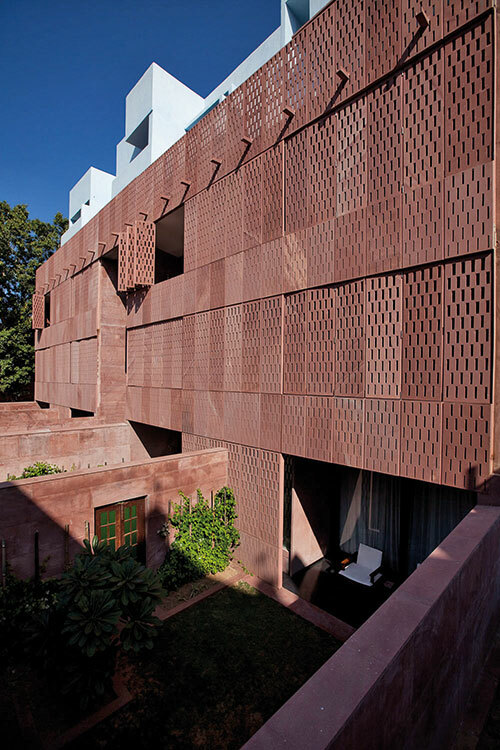 The stunning hand-cut moveable stone screens on the windows are made from the same red stone as the fort, with a play on the traditional Rajasthani jali work (in this case, cut into delicate rectangles so as to allow the light to stream in, in unusual ways). The handcrafted stone slabs with delicate circular cut patterns, the poured limestone and terrazzo tile flooring, the repurposed old haveli stables, the pathways connecting the old structures and the newer buildings, the pool and gardens all seem to cohabit seamlessly. This area in the old town is in the midst of an urban renewal (spearheaded by the JDH group of which Dhananjaya Singh is a founder), with the stepwells being drained, restored and renewed; the area around RAAS being developed into a hub for some of India’s great home-grown brands and the havelis being revived and repurposed. This delicate balance of preserving the essence of the culture, history and traditions of a city that has existed since the 1400s while modernising its structures is something that RAAS has contributed to with great success. Curious to know how the brothers and their chosen architects (the design group Studio Lotus is headed by Ambrish Arora, while Praxis Inc is headed by Rajiv Majumdar) conceived and executed this gem, I spoke to Nikhilendra Singh and Arora about their experience…. How did you initially conceptualise this project? Nikhilendra Singh (NS): My brother had been buying and restoring havelis in the old town and when he came upon this collection of havelis on this site, with this view, it was the first time that we seriously discussed turning it into something more than a home. We knew Ambrish socially, but more so as he had worked with our father on the restoration of the Mehrangarh Fort. His description of Ambrish and his work, ‘a non-interventionist, who was extremely respectful of the old structures’, made him the first choice. He agreed to take a look and brought with him Rajiv Majumdar of Praxis Inc in Bengaluru. We had never designed a property before, but what was actually fantastic was that everyone was committed to making it the very best. We were doing something new and with that came a sense of pride and ownership. Ambrish Arora (AA): RAAS Jodhpur was our first large architectural project and we were overwhelmed by both the challenge and the privilege. 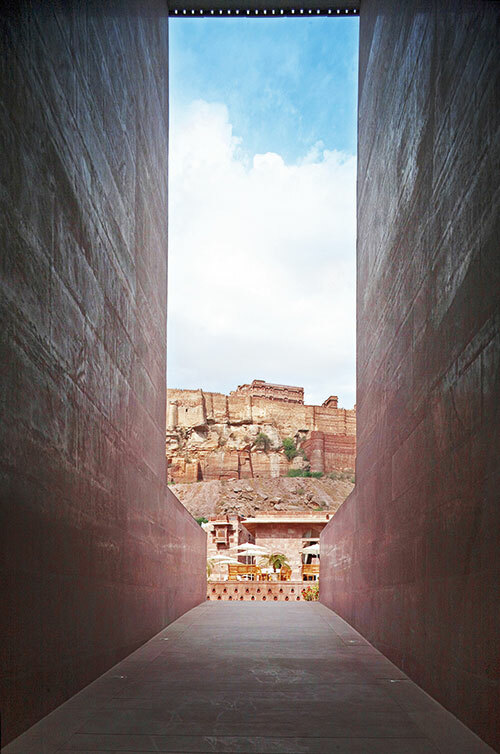 The setting (at the base of the spectacular Mehrangarh Fort), the unique challenges of the site and the project’s aspirations made it even more daunting. 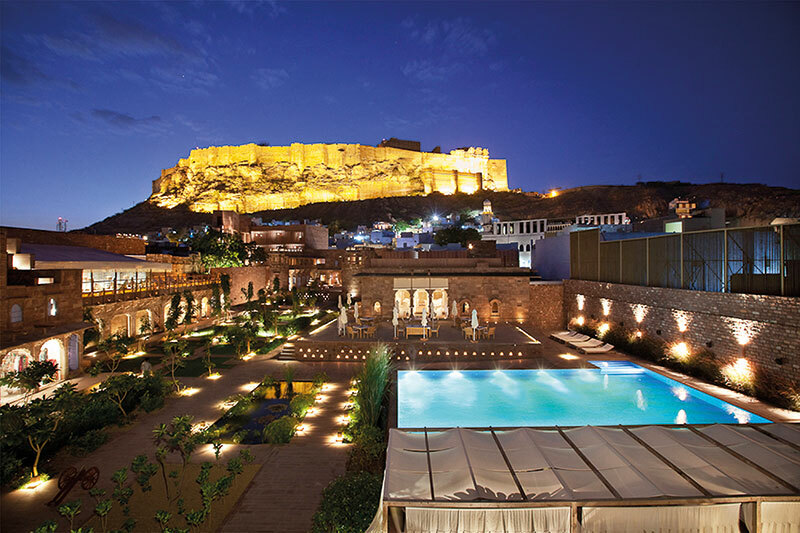 AA: Setting up a 40-room luxury hotel on a plot of 6,000 square metres with three semi-historic structures on it already and with a spectacular view of the imposing Mehrangarh Fort. The site plan needed to be a delicate balance in offering privacy while remaining inclusive with the walled city. We set out by restoring the historic buildings in lime plaster and stone. For the new buildings we worked out a contemporary vocabulary that used locally sourced materials and skills — thereby avoiding the pastiche Rajasthani haveli or palace representations of most hospitality projects in the region. This was mirrored in the interior design, yielding, in the end, what we believe is a very fresh, contemporary yet authentic experience. NS: One of the constant efforts was to maintain a contemporary look while preserving elements of the existing site. We needed to make sure we had enough rooms, without cutting the magnificent view, and we had to get the materials in through the old gates of the walled city without destroying anything in the process. Generators were brought in on camels, stone was brought in on flat beds, and it was a million layers of logistics! Was there a design challenge that you hadn’t anticipated? AA: A lot of the craftsmen did not know how to read drawings, and as work went along, they contributed in the emergence of the final form of the project which meant that most decisions on the drawing board had to be relooked at concurrently with site work. In addition, the location of the site in the walled city made material transportation a big challenge. Lastly, the fact that it was a ‘first’ project for us, the design team and the owners, meant that we made several mistakes as we went along, which in hindsight could have been avoided but which also contributed to some of the audacious moves we collectively made! I am a big fan of the hinged lattice windows…was that part of the initial design? AA: The ideas of the jalis forming the primary facade of the building emerged quite early on in the design process. However the final form was the result of a lot of iterations and developments over several months. NS: The intrinsic concept was about merging the old and the new. 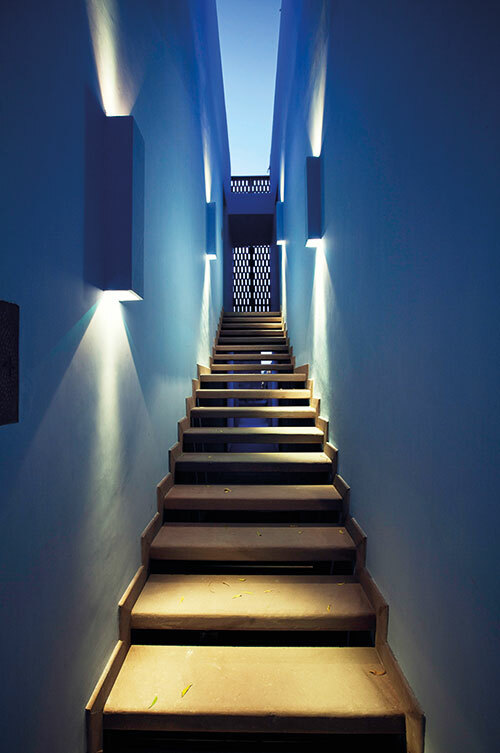 We used local stone masons who have the highest standards of craftsmanship, and the use of the traditional jali that was cut into slivers of rectangles, took the expected into the realm of the contemporary, with just that one detail (changing the shape of the pattern). It was a device that tied so much of the past and present together. Light plays a key role in the experience of a guest…and this is one of your signatures throughout; would you elaborate on how you deliberated on the play of light? AA: Light is the medium through which we experience all visual form and hence, yes, it is integral to our conceptualisation process. In Rajasthan, in particular, the blinding white light of the sun has a beautiful quality that we wanted to use as a medium of expression. 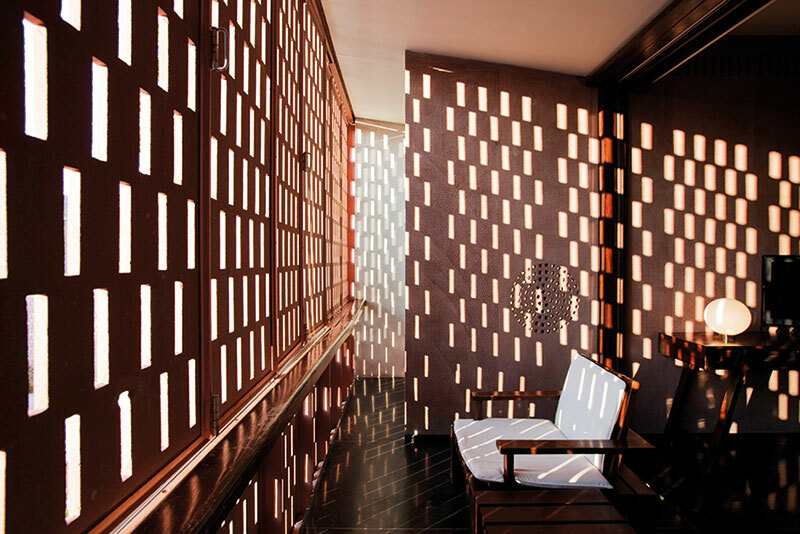 The jali openings and stairways of the project make for a rich chiaroscuro of dappled light as the sun moves across the buildings from dawn to dusk. Is there some detail that you particularly love? AA: There are slivers of mirrors set into various parts of the historic buildings that reflect hidden views of the fort and the hotel buildings themselves in relation to the fort and the sky which reveal themselves in unexpected places. NS: The genius idea of the circular pattern in the 50-mm thick stone walls that brings out the texture of the stone, all exquisitely made by hand, is one of my favourite details. It changes how the hard stone catches the light and softens these solid stone walls.